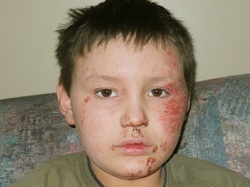 Job syndrome may present with eczematous lesion and cold, non inflamed staphylococcal abscess. Job syndrome is caused by lack of gamma interferon production by the T helper cells. This will lead to an increase in IgE level and T helper cells type 2 production. This will worsen the inflammation reaction by an increase in the release of histamine. The treatment may focus on antimicrobial treatment.